In this post, we’ll dig into what’s driving some of these trends, including logistical issues, cost concerns, and everyday life distractions. We’ll then consider how healthcare providers can create ways for patients to overcome these complications and get the care they need. 1. Cost concerns: Jennifer Taber, an assistant professor of psychology at Kent State University and lead author of a 2015 study called “Why Do People Avoid Medical Care?,” cited that cost as the most common reason people avoid the doctor. Even when insured, you can still pay massive bills in the form of higher premiums, deductibles and additional expenses. Last year, annual family premiums for health insurance through the workplace rose to $18,764, an increase of three percent from 2016, according to the Kaiser Family Foundation. What’s one solution? Encourage the more affordable routine check-ups that can catch issues on the front end before they become full-blown (and significantly more expensive) emergencies. Hospitals can be proactive and make preventive care more automated and easy to schedule. In a survey of over 300 healthcare professionals, nine out of ten experienced increased patient visits with minimal outreach. 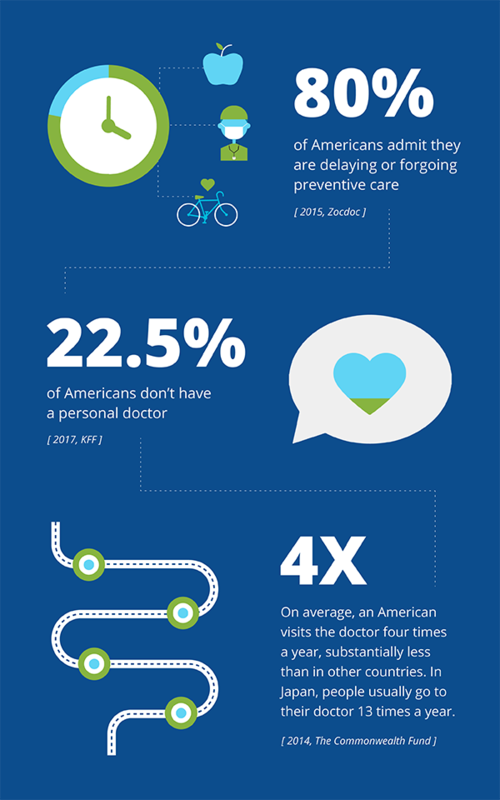 This same survey found that 24% of patients forget to schedule routine care, 20% don’t know who to contact to schedule an appointment, and 31% don’t think they can afford this care (even though it is often covered by insurance). When healthcare providers are more actively connecting with patients to ensure they are getting the routine, preventative care they need, patients will benefit in the end. Health issues will be diagnosed and treated before they become bigger problems and in the long run, their health-related expenses will be more manageable. 2. Transportation barriers: Health Outreach Partners found in its 2017 Rides to Wellness report that 25 percent of missed appointments in the U.S. are caused by transportation barriers. They found that in any given year, 3.6 million Americans miss at a minimum one medical appointment due to a lack of transportation. Uber and Lyft have jumped on this trend and are carving out a niche in the non-emergency medical transportation market, attempting to address the need for adequate means to get to medical appointments. Both have dozens of partnerships with health-care organizations and hospitals. Uber has launched UberHealth to help doctor offices' schedule rides for their patients and Lyft has partnered with Allscripts in an effort to eliminate the need for someone to manually order rides to an appointment. Partnerships like these are a step in the right direction for addressing the issue of appointments being missed due to a lack of transport. 3. Everyday life: No surprise, Americans are busy and “everyday life” often trumps a needed doctor’s visit. According to a 2015 Zocdoc study, 61 percent said that health and wellness were more of a struggle to manage than personal finances, career goals, family obligations, and even pets’ health. Bottom line, most people are just too occupied with day-to-day obligations and finding the right doctor, addressing a nagging ache or pain, and keeping their healthcare appointments don’t rank as a top priority. Our one-of-a-kind traffic site selection resource, the Average Annual Daily Traffic (AADT) Map. By conducting a traffic pattern analysis, this map will demonstrate traffic patterns, highlight access or visibility issues, and determine if traffic volume is well suited to support a new site placement. Site Location Analysis: By analyzing patient volumes, market share, demographics, traffic volumes, and growth opportunities, the Stratasan Spark Services team provides actionable insight on the ideal location options for new healthcare access points. Stratasan’s Spark Services: Offering a comprehensive suite of tools and analysis that will help you evaluate the demographics, traffic, and competition of a potential location in order to streamline the selection process. Well-placed urgent and primary care clinics will lead to a more readily available healthcare experience for a greater number of people. It can also lead to growth for your hospital or health system. It’s a win-win for everyone. There are a multitude of reasons why people are not visiting the doctor as often as they should. Some of these issues, such as high insurance premiums, a fear of getting bad news, or the general hope that health issues will just resolve themselves, are hard for healthcare providers to address. But, as displayed by the examples above, there are instances when proactive measures are within the control of a physician's’ office and they can make a difference in how often their patients are checking in. For more information on how Stratasan’s tools and services can assist with your growth planning efforts and site location analysis, contact Sean Conway and schedule a discovery call today.